I got a lot of peas in my CSA for a few weeks, both sugar snap, and shelling peas. While I love them both raw, I was in the middle of moving and had to find a way to use what I had left before it was time to pack up the kitchen stuff. 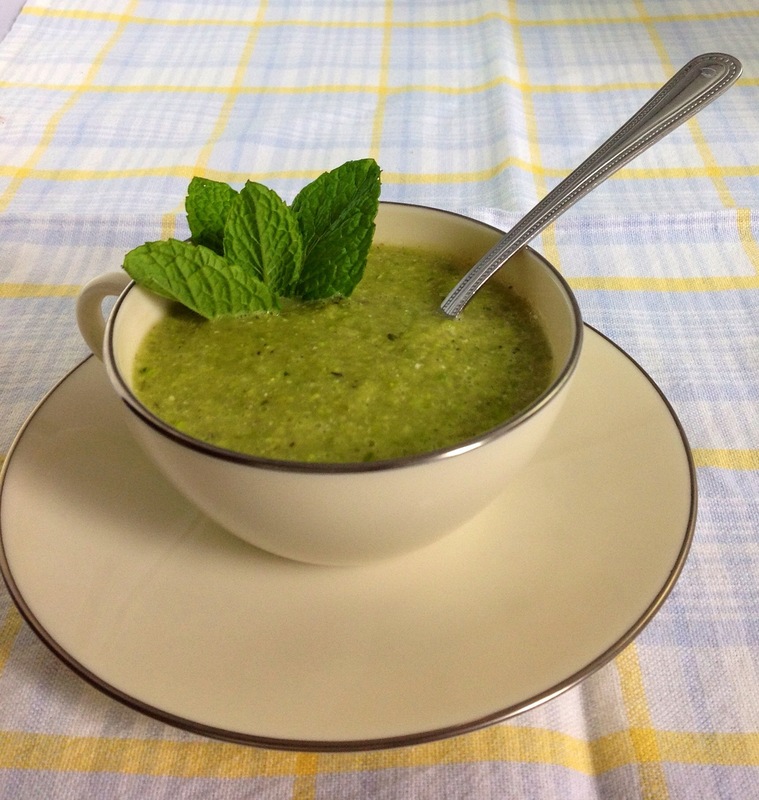 The result: Two Peas in a Pod Soup. I’m a sucker for clever names, whenever I get a pedicure, I have to read through all the names on the OPI nail polish and usually choose one based on whatever whitty name tickles my fancy rather than color. I’ve often wished I knew how one goes about getting a job naming things like nail polish, paint, and color swatches. When I was roommates during some of my time in New Orleans with my friend Jeff (from the last post), we decided to paint each room a different color. Our favorite was the living room which was a very bright shade called curious blue. We spent a lot of time sitting in that room and saying to each other “Are you looking at my blue? It’s curious!” and giggling. It may have been that we breathed in too many paint fumes as it was August and we were experiencing a whole new level of heat and humidity and thought it best to paint with the windows closed and the air conditioner running. That was my long winded way of getting to how I named my soup. Mike, my husband to be and resident sous chef these days, was helping me shell the English peas and when we found one with just two peas we got all mushy and joked about how they were two peas in a pod, just like us. I know it’s beyond cheesy, but cut us some slack we’re newly engaged and incredibly silly. Sauté the onion and olive oil over medium heat until the onions are translucent. You can use a frying pan and transfer to a large enough pot later or just sauté them in the bottom of the pot. I have a wide deep cast iron pot that works well for me. Once the onions are translucent, add the snap peas, the shelled peas, and the garlic. Sauté for about 10 minutes until the peas are soft. Add the chicken broth, mint, thyme, cumin, and salt and pepper. Bring to a boil and let simmer for about 15 minutes. I then transferred the soup to my food processer and pureed it. However, if you do not have a food processor that is sealed for liquids DO NOT try this, it will be a huge leaky hot mess. I’ve learned that the hard way over the years. An immersion blender or regular blender will work fine. At this point the soup can be strained for a smooth creamy style soup, but I’m a hearty type of girl and left mine the way it was. I couldn’t let all that good fiber go to waste. I think if I had strained the soup it would have been nice chilled on a hot summer day. If anyone tries it this way let me know how it comes out. Mike and I ate it hot with one a loaf of peasant bread from local bakery Judies in New Haven. The bread is amazing buttery and salty and extra crusty, just the way I like it!